The Five Star Vacation Rentals Team is committed to offering you specials and packaging that are designed to meet your needs and expectations. Please contact our team and allow us to see how we can make a difference in your next stay. Find us here on Instagram & here on Facebook! We welcome our Winter Texan guests each year. When a Five Star Winter Texan arrives, they are personally greeted by the President of our company at their condo. A beautiful bouquet of a dozen Texas roses await each arrival with a personal welcome note from our President. Each month, the President of the company hosts our Winter Texans off site at one of Rockport's premier restaurants or cozy eateries. Mail is delivered to each guest daily. Our Winter Texans are a vital part of our Five Star Family! K9-Pet Policy Update Kontiki Breach Resort Home Owners Association allows for only condo owners to bring their K9 pets. However, guests renting condos are no longer allowed to bring their K9 pets as the HOA insurance does not allow it. If a guest is found to have a dog in their rental, they will be asked to vacate the premises immediately with no refund - no exceptions. We apologize for any inconvenience this may cause, should your K9 pal absolutely must travel with you, management can recommend several options you may have for your fur baby to have their own fun, relaxing coastal retreat. We have over 30 years working directly with Fortune 500 companies, Travel Departments and Corporate Lodging. 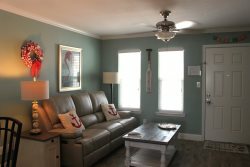 Our Corporate Guests and our Corporate Long Term Stay guests have found a home when they stay with a Five Vacation Rental property. Our Corporate Long Term Guests have a special surprise waiting for them when they arrive at their condominium, guest home or resort property. We stock their refrigerator with their first meal of steaks, baked potatoes, salad, their choice of salad dressing, Duncan Donuts coffee, and a grand dessert of their choice. We understand that being away from home for work, can be an adjustment. Our Five Star personal touches assure that our Corporate guests are welcomed and comfortable, and as close to home as we can provide. Monthly and Long Term Rates vary depending on seasonal time periods and lenth of stay.